Mango season in Bangui: all over the city trees are laden with mangos ripening from green to golden orange. Everywhere I walk or drive, young men and boys are gazing upwards, balancing very long sticks in their hands to knock mangos from the branches into the little paniers that look like small windsocks attached to the end. The air smells rich and fruity. Many of the mangos in the Central African Republic are, literally, the fruits of foreign colonization. When the French colonized this region at the tail-end of the 19th century they zealously planted mango trees that still thrive all over the country today. Driving along mud-tracks that lead to some of the remotest villages in the CAR, maybe in the world, you will often find the village entrances lined with avenues of majestic mature mango trees, gifting precious shade from the searing sun. 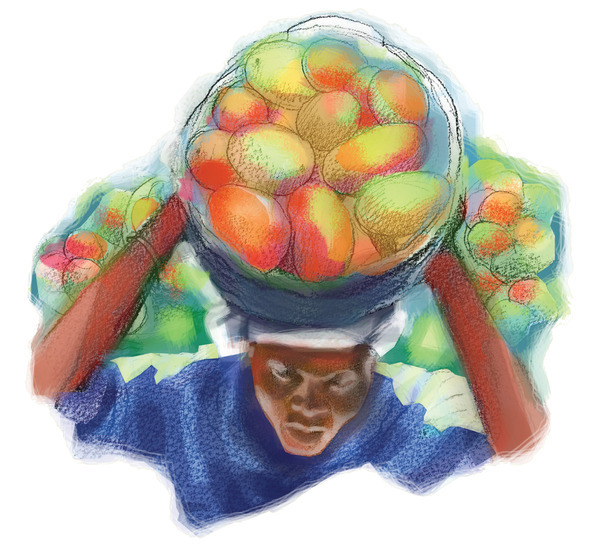 Here in Bangui, women also walk the streets with large metal bowls filled to the brim with mangos balanced on their heads – despite the heat. The irony, for them and other local fruit traders, is that mangos are so plentiful here, they’re dirt cheap. You can buy a bulging shopping bag filled with them for half a dollar. No-one is going to get rich selling mangos! Money is in very short supply for the vast majority of Central Africans, who survive on just under $1 a day (according to the World Bank). On the 2014 Global Prosperity Index, the Central African Republic ranked bottom out of 142 countries. One of the root causes of such chronic, ingrained poverty is that CAR exports almost nothing, except hardwood, raw cotton, waxes and small amounts of coffee. And these industries are still dominated by the few foreign companies that have stayed here throughout the years of political crises. The other commodity that is exported, illegally, is diamonds. Despite the UN Kimberley Process that bans the export of so-called ‘blood diamonds’, these gemstones flow out of CAR via illegal businesses and rebel groups – the border is vast and barely guarded. My Central African friends and collaborators often comment on the great irony of living in a country so rich in natural resources – and so fertile – yet still at the bottom of the global economic barrel. Usually they blame bad domestic governance, foreign interference and lack of education in equal measure. The CAR transitional government, led by President Catherine Samba-Panza, has floundered in its efforts to revive the economy of this land-locked country that shares borders with six different neighbours. It is also infested with small arms. No wonder a recent ‘National Public Consultation’ initiated by the government identified redistribution of wealth and resources, including the wealth of politicians, as one of the major concerns of communities across the country. Respondents demanded the government tackle its own corruption, and monitor activities of foreigners working in CAR, including entrepreneurs and international aid organizations. A foreign adviser to the CAR government tells me about what he calls ‘the problem of two agendas’. The international community wants CAR to move towards national elections, because successful elections mean other countries can justify reducing their level of engagement here. But not all Central Africans want elections: some politicians, and rebel leaders, are making plenty of money from their positions and they want the status quo to be maintained as long as possible. Given these tensions, there is a remarkable semblance of calm in much of Bangui. But it is a calm that can shatter easily because, as many Central Africans know to their cost, poor people are easily manipulated. Without a redistribution of wealth and resources, including education, in CAR the risks of further inter communal violence are fermenting just below the surface.